Click on the following to learn more about your favorite brands of rum! Rum plays a part in the culture of most islands of the West Indies, and has famous associations with the British Royal Navy and piracy. Rum has also served as a popular medium of exchange that helped to promote slavery along with providing economic instigation for Australia's Rum Rebellion and the American Revolution. The origin of the word rum is unclear. A common claim is that the name was derived from rumbullion meaning "a great tumult or uproar". Another claim is that the name is from the large drinking glasses used by Dutch seamen known as rummers, from the Dutch word roemer, a drinking glass. Other options include contractions of the words saccharum, Latin for sugar, or arôme, French for aroma. Regardless of the original source, the name had come into common use by May 1657 when the General Court of Massachusetts made illegal the sale of strong liquor "whether knowne by the name of rumme, strong water, wine, brandy, etc., etc." In current usage, the name used for a rum is often based on the rum's place of origin. For rums from Spanish-speaking locales the word ron is used. A ron añejo indicates a rum that has been significantly aged and is often used for premium products. Rhum is the term used for rums from French-speaking locales, while rhum vieux is an aged French rum that meets several other requirements. The first distillation of rum took place on the sugarcane plantations of the Caribbean in the 17th century. Plantation slaves first discovered that molasses, a by-product of the sugar refining process, fermented into alcohol. Later, distillation of these alcoholic by-products concentrated the alcohol and removed impurities, producing the first true rums. Tradition suggests that rum first originated on the island of Barbados. Regardless of its initial source, early Caribbean rums were not known for high quality. A 1651 document from Barbados stated "The chief fuddling they make in the island is Rumbullion, alias Kill-Divil, and this is made of sugar canes distilled, a hot, hellish, and terrible liquor". After rum's development in the Caribbean, the drink's popularity spread to Colonial America. To support the demand for the drink, the first rum distillery in the colonies was set up in 1664 on current day Staten Island. Boston, Massachusetts had a distillery three years later. The manufacture of rum became early Colonial New England's largest and most prosperous industry. The rum produced there was quite popular, and was even considered the best in the world during much of the 18th century. Rhode Island rum even joined gold as an accepted currency in Europe for a period of time. Estimates of rum consumption in the American colonies before the American Revolutionary War had every man, woman, or child drinking an average of 3 Imperial gallons (13.5 liters) of rum each year. To support this demand for the molasses to produce rum, along with the increasing demand for sugar in Europe during the 17th and 18th centuries, a labor source to work the sugar plantations in the Caribbean was needed. A triangular trade was established between Africa, the Caribbean, and the colonies to help support this need. The circular exchange of slaves, molasses, and rum was quite profitable, and the disruption to the trade caused by the Sugar Act in 1764 may have even helped cause the American Revolution. The popularity of rum continued after the American Revolution with George Washington insisting on a barrel of Barbados rum at his 1789 inauguration. Eventually the restrictions on rum from the British islands of the Caribbean combined with the development of American whiskey led to a decline in the drink's popularity. Rum's association with piracy began with English privateers trading on the valuable commodity. As some of the privateers became pirates and buccaneers, their fondness for rum remained, the association between the two only being strengthened by literary works such as Robert Louis Stevenson's Treasure Island. 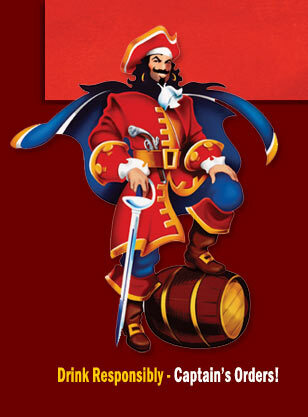 The association of rum with the British Royal Navy began in 1655 when the British fleet captured the island of Jamaica. With the availability of domestically produced rum, the British changed the daily ration of liquor given to seamen from French brandy to rum. While the ration was originally given neat, or mixed with lemon juice, the practice of watering down the rum began around 1740. To help minimize the effect of the alcohol on his sailors, Admiral Edward Vernon directed that the rum ration be watered down before being issued, a mixture which became known as grog. While it is widely believed that the term grog was coined at this time in honor of the grogram cloak Admiral Vernon wore in rough weather , the term has been demonstrated to predate his famous orders with probable origins in the West Indies, perhaps of African etymology (see Grog). The Royal Navy continued to give its sailors a daily rum ration, known as a "tot," until the practice was abolished after July 31, 1970. A story involving naval rum is that following his victory at the Battle of Trafalgar, Horatio Nelson's body was preserved in a cask of rum to allow transport back to England. Upon arrival, however, the cask was opened and found to be empty of rum. The pickled body was removed and, upon inspection, it was discovered that the sailors had drilled a hole in the bottom of the cask and drunk all the rum, in the process drinking Nelson's blood. Thus, this tale serves as a basis for the term Nelson's Blood being used to describe rum. The details of the story are disputed, with some historians claiming the term originated instead from a toast to Admiral Nelson. Rum became an important trade good in the early period of the colony of New South Wales. The value of rum was based upon the lack of coinage among the population of the colony, and due to the drink's ability to allow its consumer to temporarily forget about the lack of creature comforts available in the new colony. The value of rum was such that convict settlers could be induced to work the lands owned by officers of the New South Wales Corps. Due to rum's popularity among the settlers, the colony gained a reputation for drunkenness even though their alcohol consumption was less than levels commonly consumed in England at the time. When William Bligh became governor of the colony in 1806, he attempted to remedy the perceived problem with drunkenness by outlawing the use of rum as a medium of exchange. In response to this action, and several others, the New South Wales Corps marched, with fixed bayonets, to Government House and placed Bligh under arrest. The mutineers continued to control the colony until the arrival of Governor Lachlan Macquarie in 1810. Until the second half of the 19th century all rums were heavy or dark rums that were considered appropriate for the working poor, unlike the refined double-distilled spirits of Europe. In order to expand the market for rum, the Spanish Royal Development Board offered a prize to anyone who could improve the rum making process. This resulted in many refinements in the process which greatly improved the quality of rum. One of the most important figures in this development process was Don Facundo Bacardi Masso, who moved from Spain to Santiago de Cuba in 1843. Don Facundo's experiments with distillation techniques, charcoal filtering, cultivating of specialized yeast strains, and aging with American oak casks helped to produce a smoother and mellower drink typical of modern light rums. It was with this new rum that Don Facundo founded Bacardí y Compañía in 1862. Dividing rum into meaningful groupings is complicated by the fact that there is no single standard for what constitutes rum. Instead rum is defined by the varying rules and laws of the nations that produce the spirit. The differences in definitions include issues such as spirit proof, minimum aging, and even naming standards. Examples of the differences in proof is Colombia, requiring their rum possess a minimum alcohol content of 50 ABV, while Chile and Venezuela require only a minimum of 40 ABV. Mexico requires rum be aged a minimum of 8 months, the Dominican Republic, Panama and Venezuela requires two years. Naming standards also vary, Argentina defining rums as white, gold, light, and extra light. Barbados uses the terms white, overproof, and matured, while the United States defines rum, rum liqueur, and flavored rum. Despite these differences in standards and nomenclature, the following divisions are provided to help show the wide variety of rums that are produced. Within the Caribbean, each island or production area has a unique style. For the most part, these styles can be grouped by the language that is traditionally spoken. Due to the overwhelming influence of Puerto Rican rum, most rum consumed in the United States is produced in the Spanish-speaking style. Spanish-speaking islands traditionally produce light rums with a fairly clean taste. Rums from Cuba, Panama the Dominican Republic and Puerto Rico are typical of this style. English-speaking islands are known for darker rums with a fuller taste that retains a greater amount of the underlying molasses flavor. Rums from Barbados, Bermuda, the Demerara region of Guyana, Jamaica and also Panama are typical of this style. French-speaking islands are best known for their agricultural rums (rhum agricole). These rums, being produced exclusively from sugar cane juice, retain a greater amount of the original flavor of the sugar cane and are generally more expensive than molasses-based rums. Rums from Guadeloupe, Haïti, Marie-Galante and Martinique are typical of this style. Additionally, certain rums from the English-speaking island of Trinidad are produced from sugar cane juice rather than molasses. The flavor of light agricultural rums is significantly different than that of other rums, Panama also produce all of this. Cachaça is a spirit similar to rum that is produced in Brazil. Seco Herrerano from Panama is also a spirit similar to rum, but also similar to vodka, since it is triple distilled. The Indonesian spirit Batavia Arrack, or Arrak, is a spirit similar to rum that includes rice in its production. Mexico produces a number of brands of light and dark rum, as well as other less expensive flavored and unflavored sugar cane based liquors, such as aguardiente de caña and charanda. In some cases cane liquor is flavored with mezcal to produce a pseudo-tequila-like drink. A spirit known as Aguardiente, distilled from molasses infused with anise, with additional sugarcane juice added after distillation, is produced in Central America and northern South America. Within Europe, a similar spirit made from sugar beet is known as tuzemak in the Czech Republic and Kobba Libre on the Aland Islands. Light Rums, also referred to as light, silver, and white rums. In general, light rum has very little flavor aside from a general sweetness, and serves accordingly as a base for cocktails. Light rums are sometimes filtered after aging to remove any color. Gold Rums, also called amber rums, are medium-bodied rums which are generally aged. These gain their dark color from aging in wooden barrels (usually the charred white oak barrels that are the byproduct of Bourbon Whiskey). Spiced Rum: Theses rums obtain their flavor through addition of spices and, sometimes, caramel. Most are darker in color, and based on gold rums. Some are significantly darker, while many cheaper brands are made from inexpensive white rums and darkened with artificial caramel color. Dark Rum, also known as black rum, classes as a grade darker than gold rum. It is generally aged longer, in heavily charred barrels. Dark rum has a much stronger flavor than either light or gold rum, and hints of spices can be detected, along with a strong molasses or caramel overtone. It is used to provide substance in rum drinks, as well as color. In addition to uses in mixed drinks, dark rum is the type of rum most commonly used in cooking. Flavored Rum: Some manufacturers have begun to sell rums which they have infused with flavors of fruits such as mango, orange, citrus, coconut, and limke which is a lime rum found in Sweden. These serve to flavor similarly themed tropical drinks which generally comprise less than 40% alcohol, and are also often drunk neat or on the rocks. Overproof Rum is rum which is much higher than the standard 40% alcohol. Most of these rums bear greater than 75%, in fact, and preparations of 151 to 160 proof occur commonly. Premium Rum: As with other sipping spirits, such as Cognac and Scotch, a market exists for premium and super-premium spirits. These are generally boutique brands which sell very aged and carefully produced rums. They have more character and flavor than their "mixing" counterparts, and are generally consumed without the addition of other ingredients. Dry Rum: Dry rum is a rum made strictly from sugarcane juice fermentation. It originated in Panama, where it is commonly referred to as "'seco'"(lit. dry). The complete translation would be 'ron seco'. Most rums are made from the fermentation of sugar cane molasses, which differs from dry rums. Another difference is that dry rums are not stored in oak barrels, but in steel or aluminum vats. Unlike some other spirits, such as Cognac and Scotch, rum has no defined production methods. Instead, rum production is based on traditional styles that vary between locations and distillers. Most rum produced is made from molasses. Within the Caribbean, much of this molasses is from Brazil. A notable exception is the French-speaking islands where sugarcane juice is the preferred base ingredient. Yeast, and sometimes water, are added to the base ingredient to start the fermentation process. While some rum producers allow wild yeast to perform the fermentation, most use specific strains of yeast to help provide a consistent taste and predictable fermentation time. Dunder, the yeast-rich foam from previous fermentations, is the traditional yeast source in Jamaica. "The yeast employed will determine the final taste and aroma profile," says Jamaican master blender Joy Spence. Distillers that make lighter rums, such as Bacardi, prefer to use faster-working yeasts. Use of slower-working yeasts causes more esters to accumulate during fermentation, allowing for a fuller-tasting rum. Many countries require that rum be aged for at least one year. This aging is commonly performed in used bourbon casks, but may also be performed in stainless steel tanks or other types of wooden casks. Due to the tropical climate common to most rum-producing areas, rum matures at a much faster rate than is typical for Scotch or Cognac. An indication of this faster rate is the angel's share, or amount of product lost to evaporation. While products aged in France or Scotland see about 2% loss each year, rum producers may see as much as 10%. After aging, rum is normally blended to ensure a consistent flavor. As part of this blending process, light rums may be filtered to remove any color gained during aging. For darker rums, caramel may be added to the rum to adjust the color of the final product. Besides rum punch, cocktails such as the Cuba Libre and Daiquiri have well-known stories of their invention in the Caribbean. Tiki culture in the US helped expand rum's horizons with inventions such as the Mai Tai and Zombie. Other well-known cocktails containing rum include the Piña Colada, a drink made popular by Rupert Holmes' song "Escape (The Piña Colada Song)", and the Mojito. Cold-weather drinks made with rum include the Rum toddy and Hot Buttered Rum. In addition to these well-known cocktails, a number of local specialties utilize rum. Examples of these local drinks include Bermuda's Dark and Stormy (dark rum with ginger beer), and the Painkiller from the British Virgin Islands. Rum may also be used as a base in the manufacture of liqueurs. Spiced Rum is made by infusing rum with a combination of spices. Another combination is jagertee, a mixture of rum and black tea. Rum may also be used in a number of cooked dishes. It may be used as a flavoring agent in items such as rum balls or rum cakes. Rum is commonly used to macerate fruit used in fruitcakes and is also used in marinades for some Caribbean dishes. Rum is also used in the preparation of Bananas Foster and some hard sauces. Ti Punch is short for "petit punch", little punch. This is a very traditional drink in the French-speaking region of the Caribbean.